Have you heard the song "Aaj blue hai pani pani .... aur din hai sunny sunny?" I heard this song for the first time in my elder one's school, where they were performing a dance on cultural day with theme as 'Seasons' . This song was to represent summer season [probably because of the words like beach, blue, pani , etc] . Though I failed to understand the lyrics [except the mentioned words and few more], couldn't resist tapping my feet to that catchy tune. Later as I got busy watching each and every kid in their summer costume dancing cutely on the stage, decided to look into the song and video back home. These days I get to know bollywood songs that have gone viral courtesy my kids so you see there are more I haven't watched yet [with no clue about the reason for their success]. Back home when I was watching the song on youtube, again I was struggling to pick up it's lyrics. Whatever I could had no meaning and missed to kindle any emotions, but the song was not just getting out of my head. The harder I tried to stop singing it the more louder it was playing at the back of my mind, because kids were singing in their own style, tuta phuta lyrics and later followed by "ta ta ta". It was not just singing but dancing with some funny steps. Switched off the youtube video and continued to watch their dance. The session continued with "Lungi dance" and "Tattad tattad" songs. Loved watching them doing it. By the end of these 3 songs they were tired so thought of making some quick energizing snack. Switched my mood [had to] by tuning into golden oldies. 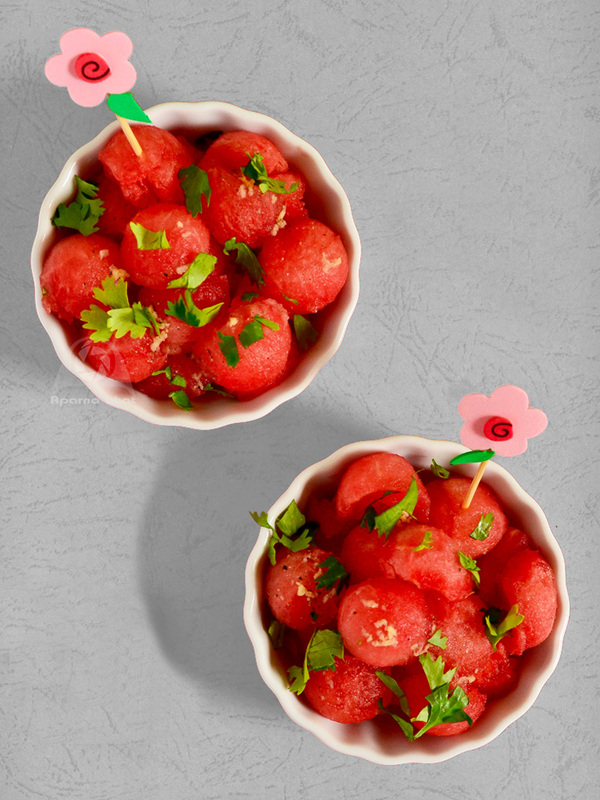 Entered the kitchen and found some watermelon balls sitting in the fridge. Gathered other ingredients and prepared watermelon salad. Kids enjoyed eating it and I enjoyed the salad with music playing in the background, my fav Kishore da singing "Aapki aankhon mein kuch mehkehue se raaz hai " ... so beautiful with meaningful lyrics. Such oldies remain unmatched to the present day songs that come and later are forgotten forever. 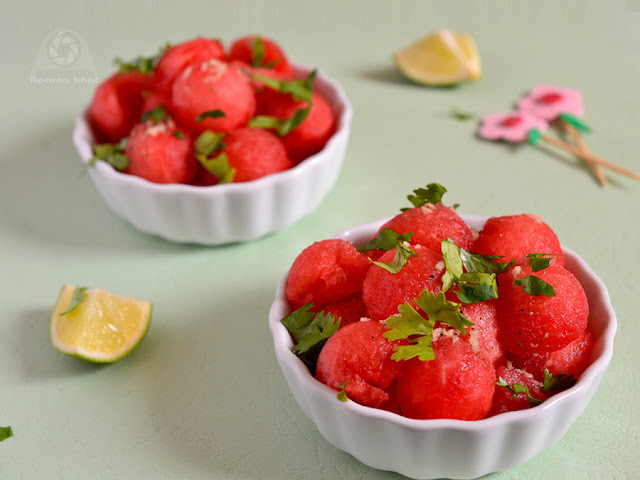 Regarding the recipe, its a super simple delicious refreshing salad. Thanks to my friends who had shared their attempt. 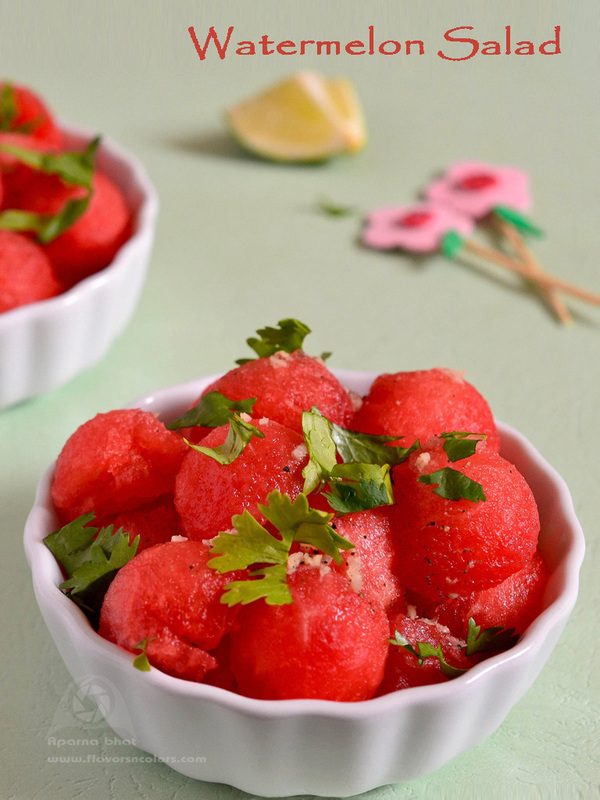 The recipe came in right time when the scoops of watermelon were ready and so it became easy, just to toss the ingredients. Clean the watermelon, remove the skin. With a melon baller/fruit scooper take out small roundels from the fruit flesh. Remove seeds. Put the balls in serving bowls and keep them refrigerated to chill. In another mixing bowl, mix the dressing ingredients and pour it over the watermelon balls in the serving bowl. Toss it once and garnish with finely chopped coriander leaves before serving. If you don't have melon baller/ fruit scooper , go ahead and make small squares from the fruit flesh. Cant take my eyes from ur salad, very attractive and catchy.